Non-enveloped, spherical, capsid of about 27-33 nm with icosahedral symmetry. 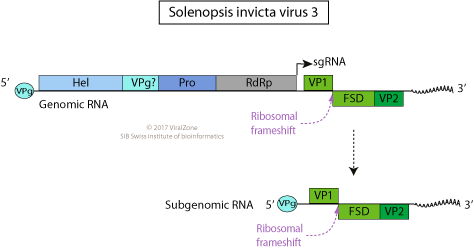 The virion is constructed from two capsid proteins VP1 and VP2. Monopartite, linear, ssRNA(+) genome of 10-11 kb in size, polyadenylated. Subgenomic RNA translation gives rise to the capsid proteins. ETYMOLOGY Solinviviridae: from name of type species host Solenopsis invicta.